Run Your Race | Are You Zhazha? It’s a motto to help you stay focused and calm about the goal at hand. It helps take me out of the competition with others and make it a competition with myself. Run your race. I will not let another runner distract me from my goal. So what if they’re running faster than me? Who cares if I just got passed by someone younger/older? That speed walker up there is crushing my above-average pace. Can I catch up to her? Head shake, slap. Stop. Focus. Run your race. I’m not in it to win it their way – I’m in it to win it mine. Not to cross the finish line first or fastest to win but to set a goal that keeps moving me forward in ability. Complete the goal? Success – even if your number is toward the bottom of the pack. Don’t let that bother you. Don’t compare, even though it’s so easy to measure minutes. Didn’t complete the goal? Try again and don’t beat yourself up about it. There’s always tomorrow. A better run day. A better run feeling. Run your race. I set goals for myself for each race but I tend to pad them out a bit so that I won’t be disappointed by overshooting my abilities or maybe I’ll be really happy when I surpass the number I zeroed in on for my target time. I’m sure there’s a science to setting a new goal time but mine is all in my heart and head. It’s the number I want next. Recently, that number was 32 minutes. 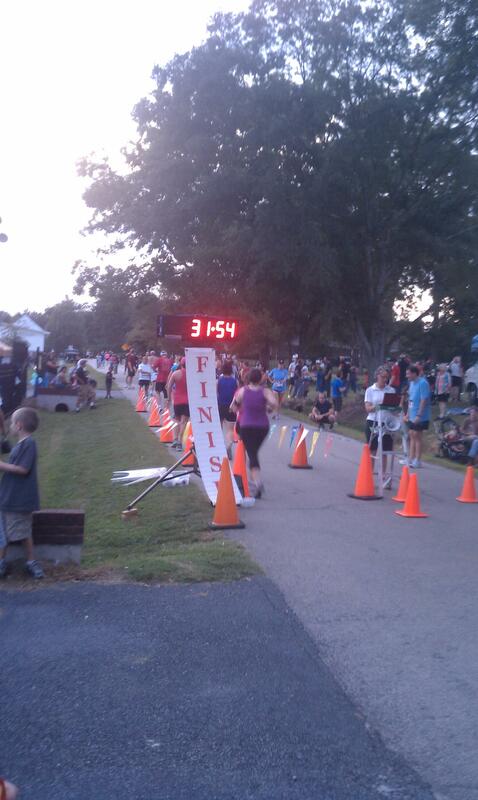 My best 5K time at the point when I set that goal was 34:37 from a race in March. My want is to run a sub-30 minute 5K. Maybe someday but I thought that would be a huge jump from 34 so I split the difference – and I did it. 31:54. Through the hills, body aches telling me I was evil and other faster runners, I ran my race. Next up, a mud run obstacle course with a team of tough ladies and then the big race I’ve been training for – the Rock-n-Roll Half Marathon. To run my race for that, I really just need to finish – being it’s my first half. I’m kind of hard on myself though so I’m setting a time goal too. I’m hoping I finish around 2:45. There’s a small sliver of maybe (based off my current training times) that I could finish around 2:40 but I’m not going to say that number out loud. I don’t want to start trash-talking myself yet. After all, I’ll be running my race.